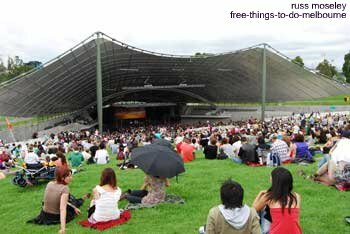 The Melbourne Symphony Orchestra play four free classical concerts at the Sidney Myer Music Bowl every February. .......Just walk up the left hand side of St Kilda Road from Federation Square and there'll be signposts to it. 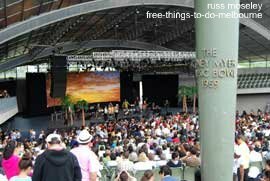 I went to the Bowl a few days ago for a free mambo concert as part of the Australia Day celebrations. It's a great stadium. 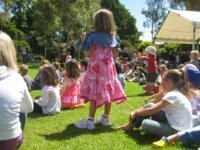 It's a picnic type venue with lots of grass on a sloping site so bring a rug and picnic and maybe some binoculars if you don't get there early. Capacity is 10,000 but recently this event has attracted more people than it holds so get there early. There are 2000 seats and room for 8000 on the lawn. Just turn up in the queue for the main gate and you'll be given an entry pass while standing in the queue - as long as there's room in the Bowl. Check out it's location in the map below. For details of concert dates click on MSO Website from about January. Concerts start at 7pm but gates are open from 4pm. There are a few conditions of entry which you can read on the above website but basically it's to only bring in plastic drinking glasses or paper cups and not to bring in hard sided hampers, eskies, coolers or other items which could be used as an elevated seat.